Investors can’t get enough of private equity. 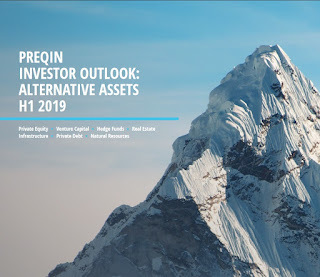 According to research firm Preqin, private equity firms’ assets under management ballooned from $580 billion in 2000 to $2.4 trillion by June 2015 (the latest date for which numbers are available). Private equity investing has become de rigueur for big money managers ever since The Yale Endowment made piles of money in the funds years ago -- making private equity a fixture for money managers trying to emulate Yale's model. Current expectations for low returns on U.S. stocks and bonds, at a time when many hedge funds are stumbling, has also left many investors seeking private equity returns to breathe life into their portfolios. But some investors, according to my Bloomberg News colleagues, are bypassing private equity firms and fishing for deals directly in order to sidestep the firms’ steep fees – 2 percent annually on assets and 20 percent of the profits. This appears to be wealthy families seeking alternatives, so that may be a narrow -- while still crucial -- portion of PE firms' clientele. 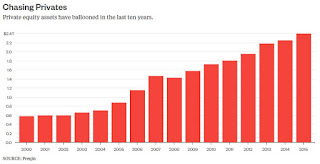 Even so, investors focused on getting such exposure more affordably, might ask themselves whether this is the right time to rush headlong into private equity at all. 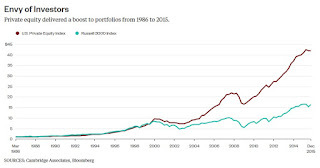 Private equity has historically delivered a boost to portfolios, and with less volatility than public markets to boot. Cambridge Associates’ U.S. Private Equity Index returned 13.4 percent annually net of fees from April 1986 to December 2015, with a standard deviation of 9.4 percent (the longest period for which data is available), while the Russell 3000 Index returned 9.9 percent annually over the same period, with a standard deviation of 16.7 percent (including dividends). Lower volatility doesn’t necessarily mean less risk, of course. In fact, it’s widely believed that the higher return from private investments is compensation for more risk (and for locking up your money for years or even decades). Private investments are less volatile simply because they aren’t subject to the daily gyrations of stock markets. Still, the effect of higher returns with smaller bumps is irresistible to private equity investors. Now imagine how much more irresistible private equity would be without those pesky management and performance fees. Those fees are even more costly than they appear. 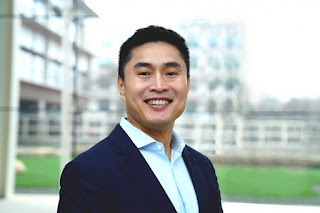 Private equity funds generally charge a management fee on all money committed by investors, not just money that the fund actually collects for investment. In other words, investors pay a management fee on money that sits in their bank accounts awaiting a call from the fund. Also, private equity funds only get paid a performance fee on investments that they’ve sold, which incents funds to sell winners that might otherwise have continued to make money for investors. So now you have some investors seeking alternatives to private equity funds. Private equity returns have also historically benefited from liberal use of leverage and 30 years of declining interest rates – a potent combination that is coming to an end. It’s unlikely that interest rates can go meaningfully lower. And banks are increasingly more discriminating due to stricter capital requirements, which means less lending to private equity firms. Tighter lending has already started to change the structure of domestic buyouts. According to research firm PitchBook, for example, the median equity in U.S. buyouts rose from 35 percent in 2013 to 45 percent this year. 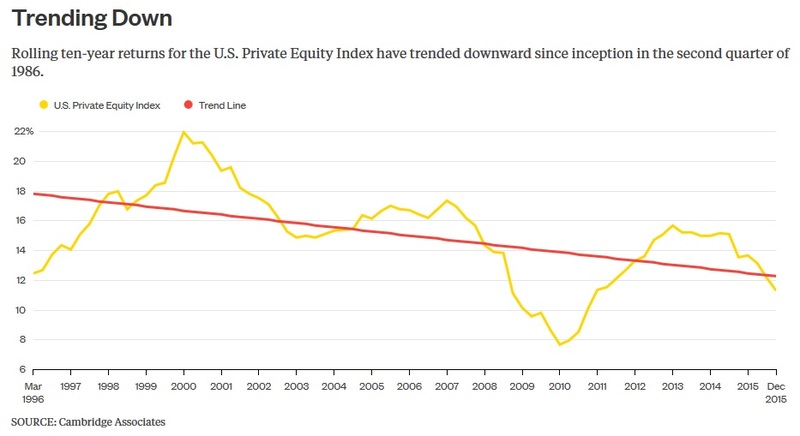 By one measure, private equity returns are already in decline. The rolling ten-year returns of the U.S. 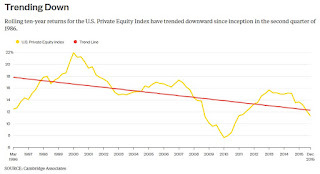 Private Equity Index last peaked in 2013 and have been downhill ever since. 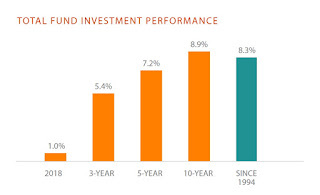 Most recently, the Index returned 11.3 percent annually from 2006 to 2015, well below its long term return and approaching the long term return from public markets. So while investors may be able to pick up private equity on the cheap, it’s no longer clear whether that's a wise move. Last July I covered the end of private equity superheroes and followed that up with comments on a bad omen for private equity returns and private equity's not so golden age. Times are tough for private equity, hedge funds and most active managers (but the latter can't charge 2 & 20 for their underperformance). None of this should surprise any of you. I've long warned you to prepare for lower returns in a deflationary environment where ultra low and negative rates are here to stay. Even the Governor of the Bank of Canada is warning pensions to brace for lower rates (which means lower returns). The good years are over for a lot of reasons. 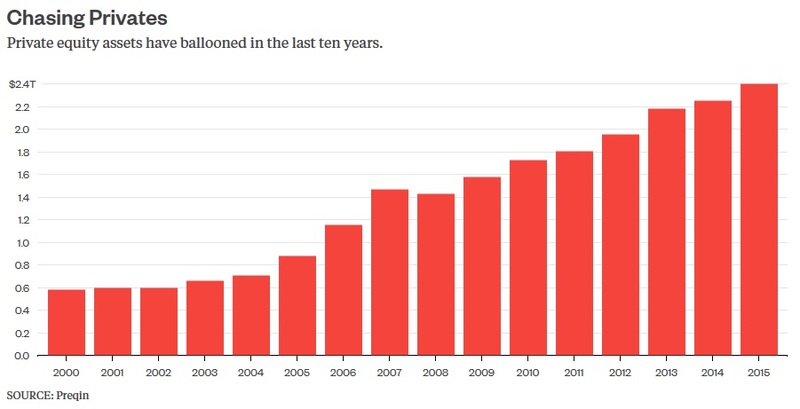 Too many delusional public pensions listening to their useless investment consultants got bamboozled into shoving ever more of their assets into alternative investments like hedge funds, private equity and real estate. It worked well for a while but when everyone is doing the same thing, chasing yield at all cost, guess what, things don't pan out too well. Why? Because as more and more money chases alpha, it necessarily diminishes the future returns of these alternative investments. In 2005, Tom Barrack, one of the greatest real estate investors in the wolrd, cashed out before the downturn stating: "There's too much money chasing too few good deals, with too much debt and too few brains." People were mocking Barrack back then but he got the last laugh. Who cares? Pensions know all this but they still need to make their actuarial return of 6%, 7%, 8% or more which forces them to take ever more risk in illiquid alternatives and hedge funds at the worst possible time. Well, it tuns out the people that profit the most off this "new asset allocation model" are hedge fund and private equity gurus gathering ever more assets, charging fixed fees no matter how poorly they perform, reaping billions in the process. But those chronically underfunded US public pensions are not benefiting from all this in any meaningful way. They're basically doing what everyone else is doing, hoping for the best. And the game goes on and on and there's a reason for this. 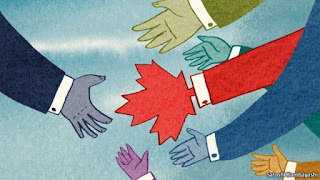 Unlike their large Canadian counterparts, US public pensions don't have the right governance, can't attract and retain very qualified investments managers to invest directly in public and private assets across the world, so they're forced to keep farming out more assets to external private equity and hedge funds charging them insane fees even if they're not delivering the goods. I know, Stephen Schwarzman and Blackstone are Wall Street's unstoppable force, but as great as they are at managing money, I'm increasingly worried about how we are going to fix the US public pension crisis once and for all. Shoving ever more money into hedge funds and private equity funds is great for Steve Schwarzman, Ken Griffin and other "elite" alternative investment managers charging huge fees but it won't make a dent in terms of helping chronically underfunded US public pensions. Below, Carlyle Group LP’s David Rubenstein said it was unexpected that so many hedge funds made wrong macro bets, leading to the industry’s worst start to a year since 2009. I'm not surprised and think a lot of macro funds entering into the same trades are going to continue getting clobbered because they're not reading the macro environment properly. 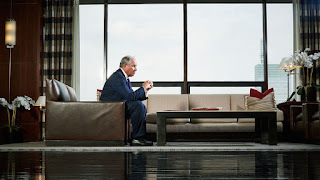 On Wednesday morning, at the SkyBridge Alternatives hedge fund conference, Carlyle Group co-CEO David Rubenstein interviewed Summers alongside his Clinton administration colleague, Robert Rubin. But at one point, Summers turned the tables on Rubenstein, with an assist from Rubin. The interviewees noted that Rubenstein could teach the audience some lessons on influencing government, given his surprisingly successful record of fighting to retain the "carried interest" tax loophole, which gives private-equity and hedge fund managers a tax preference on their performance fees. "Rarely has a policy existed so long with such weak arguments in its favor," said Summers, in backhanded praise of Rubenstein's lobbying skill. "It's the First Amendment, the Second Amendment, and carried interest, right?" "Not necessarily in that order," Rubin added. Rubenstein replied that, if Summers and Rubin thought the tax preference for carried interest was such bad policy, then they could have used executive action to eliminate it when they served in the Treasury Department. "Not sure it works like that," Rubin replied. He's right: You would need legislation to close the loophole, and that legislation has been stalled by private-equity-friendly members of Congress. Rubenstein clearly preferred to discuss other topics, such as why neither Summers nor Rubin chose to put a woman on American currency. He returned to the tax-preference issue only at the very end of the discussion. "We've run out of time," he said. "We'll have to talk about carried interest some other time." Summers is right, the carried interest tax loophole which private equity and hedge fund managers lobby hard for is an absolute abomination and it should have been closed years ago. Of course, in an era of diminishing returns, don't count on that happening any time soon. Update: Yves Smith of Naked Capitalism posted a comment on a new study blasting private equity fee abuses. I will let you read her highly critical comment and I embedded a clip of Oxford professor Ludovic Phalippou going over some of these abuses with his students. Hedge Funds' Day of Reckoning? 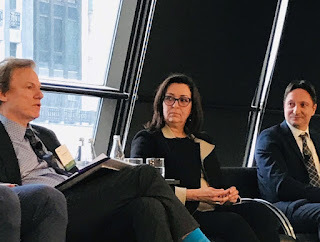 Why Is Mark Wiseman Leaving CPPIB? Best Canadian Pension You Never Heard Of? Ottawa Taps Pensions For Infrastructure? The Dog Which Has Not Barked? Payouts Fit For Hedge Fund Kings? The Death of 2 & 20? Beware of Billionaires Bearing Stock Tips? Less Bang For Your CPP Buck? Feels More Like 2007 Than 1997? Fixing The U.S. Public Pension Crisis?